Fortunately, it was an unpublished decision. Unfortunately, it is an authored opinion, so it can be cited for its persuasive value. Let’s hope that trial courts actually read the statutes — rather than be persuaded by an appellate court that did not. In Marcott v. Marcott, No. 2013AP96, released Feb. 27, the appellate court affirmed an order by Clark County Circuit Judge Jon Counsell finding the mother, Sara, in contempt for enrolling the children in a new school district without permission of the father. For authority, Sara first relied upon Wis. Stat. § 767.41(6)( c), which, regrettably for her, applies only for the purpose of determining eligibility for aid or for benefits. Second, she relied upon Westrate v. Westrate, 124 Wis. 2d 244, 369 N.W.2d 165 (Ct. App. 1985), which the court held didn’t apply because, among other reasons, Sara stipulated to joint legal custody. Then she argued that she couldn’t be held in contempt for failing to obey a statute, rather than a specific court order — an argument that was never going anywhere (but points for creativity). Too bad Sara didn’t simply rely upon the joint custody definition in the statutes. So, here’s my question: If Sara had the right to make decisions, including choice of schools, how can she be held in contempt for doing so? The answer, of course, is she can’t; except she was. The misreading of the statute by the appellate court is not unusual. After all, “joint” seems to mean that major decisions have to be made together. Therefore, if one party makes a decision unilaterally, it would be a violation of the statute. However, as can be seen from the above language, the legislature defined the word “joint” to mean “several” by giving both parties the right to make such decisions. Where the parties are not in conflict, this right, limited to just six decision areas, doesn’t matter. Where it does matter is where one party exercises their right to make a major decision over the objection of the other. The most common examples are choice of schools and taking a child to a mental health therapist. Under that circumstance, the court is to either award decision in that area (or in all areas) to one parent while maintaining joint legal custody in other areas — or to terminate joint legal custody altogether and award one parent sole custody. Until then the statute clearly provides that neither parent has superior rights, which means they have equal rights. Nowhere does it require the parents to agree — or even discuss these issues. 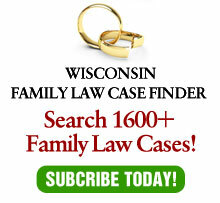 In other words, we do not have “joint” legal custody in Wisconsin as that term is usually defined. Instead we have “several” custody. While Sara was wrong in what she did, there was no basis to hold her in contempt. It’s not her fault that the statute says what it says.